Enjoy making Easter small greeting cards, gift tags or place cards for the Easter table with this printable Easter bunny craft sheet. 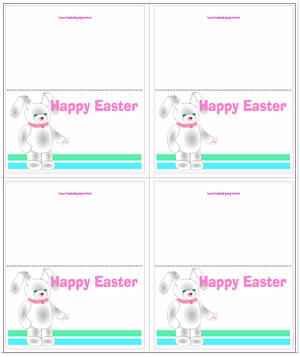 Each Adobe PDF craft sheet prints 4 cards with the same Easter Bunny design (see illustration, right). PROJECT TIPS To make gift tags, small cards, or table place cards simply print the sheet of mini cards onto card stock, cut out and fold, then add a guest's or gift recipient's name to the front of the card. You can also use this sheet to make name tags or labels - print the sheet onto self-adhesive paper, cut off the back flaps, and attach. If you use heavy paper to make tags or labels, attach with a pin, tape or adhesive. Happy Easter!